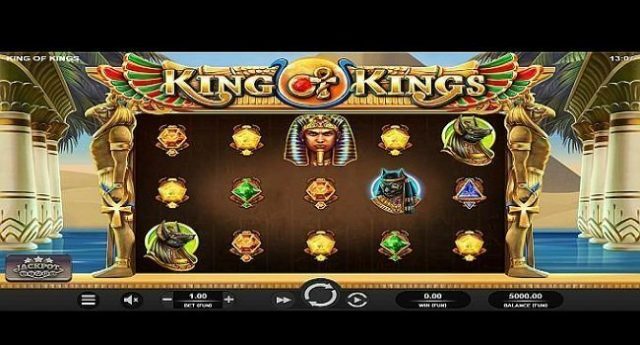 King of Kings is a new online video slot developed by Relax Gaming for which Reels are 5, Rows are 3 and Paylines are 5. Return of player (RTP) percentage for this latest video slot powered by Relax Gaming stands 96.25% and maximum possible Payout is 5000 times of your stake. Bet Size for King of Kings slot machine ranges from 10p per spin to up to €£50 per spin. The game comes-in with Bonus Symbol Re-Spin, 6-Reel Free Spins & Bonus Symbol Upgrade. King of Kings slot is a bit like Big Time Gaming’s Book of Gods video slot. The game is being set within an open oasis temple where you would see statues of Horus on both sides of the reels. There are a total of 9 symbols can be seen in this Egyption mythology based video slot and you would also witness dunes and a majestic pyramid in the backdrop of the game. The yellow, blue, green, orange and red scarab gems are the low paying symbols in this game while Egyptian deities like Bastet, Anubis and Horus are high value symbols that will pay you more when they appear. The Horus is the protector of the Egyptian ruler; the Bastet is the cat godess, while the Anubis symbol is the symbol of regeneration. Meanwhile game’s most rewarding symbol is Tutankhamun (the cartoon style depiction). This symbol will pay you 200 times of your stake if you land 5 of these symbols across your Payline. The game also has a wild as well as scatter symbol in the form of ‘the golden Ankh’ which can replace all other symbols on reels 2, 3, 4 and 5 and would reward you 2,20,200 or 1000 times of your stake. 1 free spin and randomly chosen symbols will be available in this feature and if you are lucky to Land Tutankhamun’s symbol on your screen and you would receive 1000 times of your stake during this feature. Free Spins feature- Land 3 or more Wild or Scatters and you would hit the free spin feature to receive 10 free spins and in that case the reel area will expand to 6 reels. The 6 reel King of Kings gaming will increase your chances to win a whooping 5000 times your stake per spin and if you are very lucky then you might win over 10,000 times of your stake that is very impressive indeed!